Two American soldiers fight to the death in Vietnam. That’s the start of Universal Soldier, which imagines the pair being brought back to life and given superstrength so they can (inevitably) fight each other again. The movie is stupidly entertaining—but like the UniSol program itself, there are some serious glitches. Universal Soldier was the Hollywood breakout film for German director Roland Emmerich, whose next three films were Stargate, Independence Day, and Godzilla; later, he’d lean even heavier into large-scale disaster epics with The Day After Tomorrow and 2012. It was also his first collaboration with Dean Devlin, who’d go on to co-wrote some of his biggest hits. Most of Universal Soldier’s reason for existing is to pit these two guys against each other, and indeed there are some epic fight scenes, especially after they become transformed into supersoldiers, and especially after they start injecting themselves with the equivalent of supersoldier steroids. There’s also some fish-out-of-water jocularity around Van Damme’s character, who gets into silly situations because he doesn’t realise you’re not supposed to do things like order dozens of plates of diner food when you have no way to pay for it, or walk around in public stark naked. The third lead is Veronica, a plucky and very recently unemployed TV reporter played by Ally Walker, who accidentally gets drawn into the violent feud between the two men, and is also there to react to Van Damme’s social clumsiness. Sarge loves collecting and wearing other people’s ears. But Universal Soldier isn’t just about two muscle men brawling with each other while existing in time-out-of-mind confusion. Military sci-fi has been a recurring genre throughout Emmerich’s career, and you can really see that fascination taking shape here. There’s no shortage of horror, either. The titular program goes all the way back to the Vietnam War, when a top-secret program started snatching soldier corpses and packing them in ice so that they could be revived decades later with greatly enhanced strength, super-healing powers, a pesky tendency to overheat, zero memories of their life before, and complete subservience to the shifty Colonel Perry (Ed O’Ross). Somehow, this clandestine project has been in operation for 23 years according to the timeline of the movie, and it can’t have been cheap (the UniSol wranglers tool around in a fancy mobile lab, and we’re told each soldier is worth $250 million)—so it’s kind of amazing how quickly it goes to hell. We’re talking one mission, then everything instantly turns upside down. 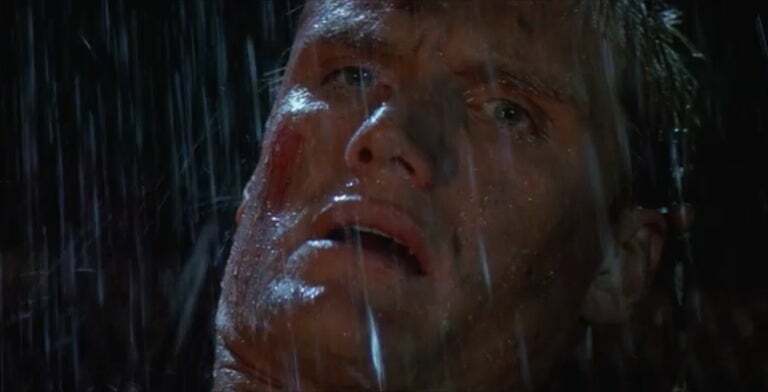 During a hostage rescue, Van Damme’s character, Luc, begins to recover his memory, just as Lundgren’s character, Sarge, slips back into being the sadistic monster we met during the Vietnam-set prologue. To reiterate, these guys—one who has a propensity for wearing human body parts as jewelry—have already killed each other once. Sure, UniSol wanted to keep things very hush-hush, but couldn’t they have done a little vetting of the men they were planning on transforming into killing machines? Other than the two “beatin’ up on country folk” scenes (for Luc, it’s the customers in that diner who, pretty understandably, get salty when he says he can’t pay his huge bill; for Sarge, it’s in response to being taunted by patrons of a honky-tonk, who probably should’ve known better once they saw the ear necklace), Universal Soldier’s best moment comes when this erstwhile Dr. Frankenstein enters the picture. Dr. Gregor is played by Jerry Orbach—this movie came out the same year he started his epic stint on Law & Order—who’s one of very few actors capable of making ludicrous lines like “By hyper-accelerating the bodies, we discovered that we could turn dead flesh into living tissue” feel credible. He’s only in the movie for one brief scene to unload some vague exposition, and really doesn’t offer up anything the movie hasn’t already explained, but he still brings way more gravitas to the movie than it really deserves. Universal Soldier wasn’t a huge smash, but it attracted enough interest to spawn several sequels (none involving Emmerich or Devlin, though both Van Damme and Lundgren reprised their roles more than once). The idea of the supersoldier wasn’t new back in 1992, and it’s still a popular sci-fi trope today. But while Universal Soldier is mostly a movie about physical combat and woodenly-delivered one-liners (“You’re discharged, Sarge”), it does explore the idea of accountability, and its macho face-offs have a certain undercurrent of existential horror to them. These guys, as an undead monster once said, belong dead—the psychotic Sarge, for obvious reasons, but that goes for the haunted Luc, too, whose robotic countenance begins to waver when he realizes how much of life has been stolen from him. The sequels, of course, followed what he did with all that lost time, but the original film ends without providing any real emotional closure—unless the sight of Sarge being fed into a wood-chipper counts.